American Payment Solutions, premier integrated Acumatica and Sage credit card processing provider announces sponsorship of 90 Minds, Annual Meeting of the Minds, March 1 - 3, 2018 - San Diego, CA. "By combining the competitive processing rates and state-of-the-art security of APS with the flexible mobility of Sage 100, we’re empowering SMBs with error-free, fast payment processing on the go,” said Phillip Heath, President of American Payment Solutions. 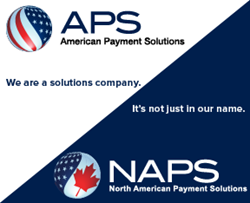 American Payment Solutions (APS), leading integrated Acumatica and Sage credit card processing solution, announces annual 90 Minds, Meeting of the Minds sponsorship. The annual 90 Minds, Meeting of the Minds 2018 will be held March 1 through March 3, 2018 in San Diego, CA. The Meeting of the Minds offers Sage and Acumatica ERP consultants, resellers, developers, ISVs, and software publishers the opportunity to collaborate and share relevant competitive industry information enabling these member companies to propel their mutual business to the next level. APS’ Acumatica merchant services integration is an Acumatica-Certified Application (ACA). This title represents a select group of development partners whose applications have met the highest standards set for Acumatica integration and functionality. Acumatica is a comprehensive, browser-based cloud ERP solution optimized for ease of use, adaptability, mobility, speed and security. APS' Sage credit card processing integration is an option available to Sage users allowing them to reduce complexity, streamline credit card processing and exceed customer expectations. The American Payment Solution Sage credit card processing integration reduces credit card processing fees and improves cash flow.